Some UFOlogist suggest a cigar-shaped UFO ("pillar of cloud" , "by night in a pillar of fire, to give them light...") caused the parting of the red sea and undertook defensive measures against the pursuing Egyptian army. Over 400 cigar-shaped, disk-shaped and spindle-shaped objects moving in groups acrosss the face of the sun by Mexican astronomer Jose Bonilla Director of the Zacatecas Astronomical Observatory and his assistant. His photographed the UFOs, which appeared to be solid. When a group of streetcar passengers in Oakland, California, saw a winged, cigar shaped UFO emitting a stream of brilliant light. Airship Wave. UFOlogists suggest that UFOs during the Airship wave were spacecraft inaccurately described as emerging technology familiar to people of that time. Frederick Chamberlain and O. L. Jones. Although the two men could not get a clear view of it in the darkness, the object, which had two rows of red, green, and white lights on each side, looked like "most of the top of a 'prairie schooner,'" Chamberlain said. It rose at a sharp angle, then headed south just above the treetops. Mystery airships seen almost exclusively at night. Mostly described as oblong in shape. Daniel Leger noticed a kind of 'merry-go-round' in the sky, beneath cirrus clouds and above the airfield occupied by the Germans at Raineries. About a dozen German aircraft were circling around a large, aluminium coloured 'cloud', shaped like the handle of a frying pan and surrounded by puffs of cloud. It was moving slowly and horizontally, though somewhat tilted. Above this hovered another, larger and luminous 'cloud', moving at the same speed. When the aircraft came close to the cloud they appeared to fall down like leaves, only to rise again seconds later, as if their engines had been stopped momentarily. Note: Similar to the 1952 Oloron and Gaillac, France cigar-shape UFO sightings. British author Nick Redfern states, British Military records reveal that a fleet of flying discs -- called 'Foo Fighters' -- were launched from huge cigar-shaped Mothercraft during B-17 daylight raids over Germany in 1943. The huge aircraft-carrier sized Mothership cut through a flight of B-17 bombers launching its discs in front of the B-17 amazed aircrews. Two witnesses see a cigar-shaped UFO. "Longer and slimmer than a blimp; it was of smooth metal construction with no windows or openings in sight. It didn't have a gondola on its underside as normal dirigibles and blimps do." A motorist saw a large, metallic cigar-shaped object, an estimated 300-400 feet in length, hovering silently at about 5,000-10,000 feet in altitude. Each end of the craft came to a sharp point; otherwise there were no markings or portrusions of any kind. Estimated size of object twice that of a B-29 bomber. A cigar-shaped object, about five feet long and trailing smoke, passed over a small town and then "landed" on a small, uninhabited island. UFOs [even disc-shaped craft] observed in Scandinavia, Western Europe [Germany, Portugal, Belgium, and Holland], Turkey, West Africa between 1946 and 1948. Mysterious fireballs and cigar-shaped UFOs. The objects usually traveled at altitudes between about one thousand and three thousand feet. Variously described as traveling slower than airplanes or crossing the sky in seconds at fantastic speeds. Known to travel all directions, execute turns, circular maneuvers. In October  1946. Swedish defense ministry issued a communique that radar had detected about two hundred objects "which cannot be the phenomena referred to as Swedish airplanes." Eastern Airline pilots, Clarence S. Chiles and John B. "It was about 100 feet long, cigar-shaped and wingless, about twice the diameter of a B-29 with no potruding fins." "An intense dark blue glow came from the side of the ship and ran the entire length of the fuselage-like a blue fluorescent light. The exhaust was a red orange flame." Dr. Enrique Caretenuto Botta. They soon saw three UFOs in the air - one a cigar-shaped object, and two smaller, disc-shaped objects. Amazingly, the three became one, turned blood red, and zoomed away. One metallic cigar-shaped with white exhaust which turned black when it accelerated. Domingo Troncoso, customs officer in Puerto Maldonado, in the border of Peru and Bolivia, noticed a big airship shaped object flying low and horizontally in the afternoon, going from right to left. The object left a dense smoke trail, vapor or some similar thick and white substance. It was expelled from the rear end of the object while it flew. That the object was a real and structured machine can be seen by its reflection on the waters of the Madre de Dios river down below. Mr. Troncoso managed to get a camera and could take one good shot of the cigar-shaped object. Photograph published in a newspaper on July 6, 1952. Two large cigar-shaped objects. Multiple witnesses. Above the cloud was a clearly defined, narrow, white cylinder, tilted at a forty-five degree angle and moving slowly. In front of the cylinder were about thirty objects resembling puffs of smoke. 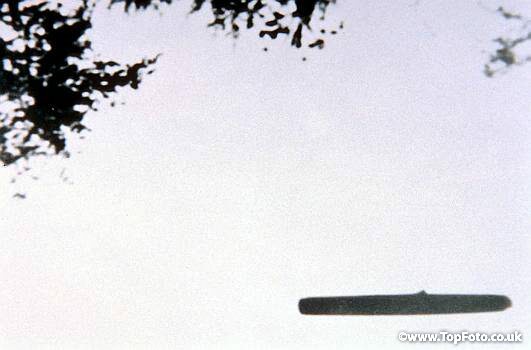 One hunderd witnesses observed a long cigar-shaped UFO tilted at a forty-five-degree angle. A Plume of smoke emerged from the upper end. 2nd Lt. E.J. Marlow, Twelve grey objects from cigar to egg-shaped, varied their formation from elliptical to wavy line to scattered to straight line to trail formation. 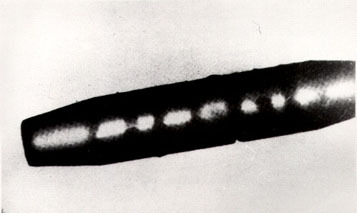 Ella Louise Fortune single photograph of large, glowing white cigar-shaped object not far from Holloman AFB. Determined to be a photograph of a lenticular cloud. Everett Clark. Four human-looking beings, unintelligible vocal sounds, entered cigar-shaped craft on ground as if "walking through glass," took off silently; elliptical imprint 5 ft. x 24 ft. found in grass. A truck driver observed a "200-foot-long cigar-shaped object hovering about 200 feet off the ground." He was so impressed by his sighting that he called the Albany Times Union newspaper and reported his sighting. One silver cigar-shaped object suddenly vanished after 8 minutes. One brown, cigar-shaped object came from below the horizon close to the witness ascending to 40-50 above the horizon in 4 minutes. During the 1950s and 1960s so called Mother-ships were seen in fairly large numbers. These are exceptionally large craft usually cylinder or cigar shaped craft although some are reported to be disc shaped. The Mother-ships are essentially modern-day aircraft carriers. On the afternoon of July 10th four boys in Fern Creek, Kentucky had a rare CE3 sighting. They saw a cigar shaped object which discharged a small disc which subsequently landed. A moment later a small entity with a large head, tight fitting clothes, and tubes like a respirator was seen. Two of the four boys received wounds from a black tube pointed at them by the entity. This was before all publicity concerning alien appearance. One bright silver, cigar-shaped object, as long as an airliner, buzzed the witness car. Mothership photo was taken by Joe Ferriere a radio announcer with his Pho-Tak 620 Reflex camera. Assuming the disc is 25 feet in diameter the Mother-ship is about 700 feet in length. The protrusion on the bottom opened and closed to launch and recover the discs. 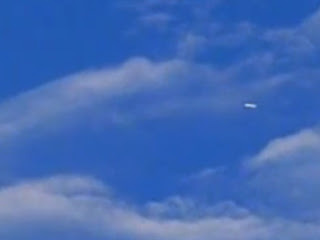 As the two co-workers watched the western sky, a white cigar-shaped object appeared over the lake. Observed a silvery cigar-shaped UFO flying from the southeast to the northwest on a straight path of at an elevation of approximately forty-five degrees. Bonabot, Jacques. They saw a sixty-foot long object resembling a streamlined fat cigar. The front end of the UFO was a red light. At the rear was a green spotlight which had swung around to illuminate the helicopter. Between the lighted ends was a gray metallic hull which reflected the red and green lights. A dome protruded at the center. Near Loxley Clarence Patterson and his pickup were sucked into a giant cigar-shaped UFO. Robot-like creatures who could read his mind removed him from the truck and subjected him to a physical examination. Patterson passed out, and awoke to find himself speeding on a road at ninety mph. Observing a blimp-sized object hovering at five hundred feet over Lake Seratoga. As the reddish, glowing UFO flashed on and off, two smaller objects approached and merged with it. After a few minutes, the two smaller objects broke away. Police officer observes a large, cigar-shaped object, flying over two private aircraft near the Pacific Gas & Electric plant. Object had fins on both ends. Source: IUR, Vol. II, No. 3. A university art professor called his wife and secretary to see the silver "stretched cigar", three tines the size of the moon in length. It was observed for three minutes as it flew in a slow straight path from southwest to northeast, with no trail, no wings, no details, no sounds. Jim Shelton. "It was a flying object with lit portholes. Fire was streaming in sparks from the rear, and it had green and yellow pulsating lights," he said. April 18, 1982; Houston, TX 2:20 PM. A woman heard a loud noise, stepped onto her patio and saw a cigar-shaped object beneath the overcast, thick in the middle and tapered on both ends. The object flew at treetop level directly over her townhouse. Mr and Mrs L. On going outside of the tent she observed a large, cigar-shaped object with a brilliant white light at the front it was coming towards them very slowly from the direction of the caravan park entrance (travelling from the west-south-west to east-north-east). The front light seemed larger than the full moon and lit up all of the caravan park. Mrs L is uncertain of the objects actual size - 'bigger than a bus' - probably 20-25 metres long. The cigar had windows along the side. These seemed to be , closed' and the same grey colour as the rest of the object. It had what looked like portholes all along the side of it. It was cigar shaped with a grey strip down the middle and a dark green on top and bottom. It was 400 to 500 yards away and about the size of a DC-3 plane or a full-size school bus. As I watched, it seemed to partially dematerialize and then return to solid form, it did this as it was moving, a couple of times. Then it dawned on me, oh, oh, I don't think I should be seeing this; it's a UFO and probably doesn't want to be seen! You always observe the same discoidal form? - No, sometimes they have been lights we followed and them. Other occasions are looked like the fuselage of an airplane DC-10 but without wings and moving in diagonal, instead of longitudinal, to brincos and loosen steam by down. That I saw several times when we followed echoes. Just offshore, 3 anglers saw a cigar shaped object hovering low over the water. The object had six windows along its edge and several man-like figures could be seen moving inside and looking out. James Payne. It was described as cigar-shaped and a dull gray with four banks of four very large bright lights. Both ends of the craft were fuzzy. The cigar shape appeared to be about 20' thick and about 200' long, although the drawing by the witness (Exhibit 1N) suggests more of a 15-to-1 ratio. Height above ground appeared to be about 300', range about 300 yards. More than an hour before sunrise, chickens were heard to be disturbed and rooster[s?] crowed as a silent, cigar-shaped object with outward shining lights moved about the area. The witness estimated the object's altitude as 200 feet, and as it moved slowly, it eventually passed directly over the witness. The homemaker, 31, looked out her back door and saw an object hovering 300 feet away. The object moved slowly toward the house, and in 7-10 minutes passed overhead. At some point it turned sharply right. The witness phoned the investigator, who she knew, and she could see the object at an estimated ½ mile away as she spoke with him. Although aircraft were reported in the area, [no further explanation], no acknowledgment between the unidentified and the aircraft was noted. The object was described as cigar-shaped or submarine-shaped with the front and back pointed. The lights were sketched with short tubes of light of purple, yellow, and green that shown outwards like “stage lights.” Pulsating lights were indicated but not explained. At the rear of the object was a V-shaped purple “corner” and two rectangular green lighted panels. The object’s surface was dark and its length was estimated as greater than two car lengths. The duration of the entire sighting was indicated to be 43 minutes. A trucker driving on I-44 heard other truckers with CB radios talking about a strange object which he assumed they were calling a UFO. He expected to see an aircraft or star but as he reached the top of the hill he saw something very strange, a cigar-shaped object with lights. A another vehicle passed him and pulled over as he also did and the both watched the object. Carlos de Sousa. He stopped to check his car and on getting out, he saw a strange aircraft about 300 feet high in the sky, flying towards Tres Coraioes, crossing over the road at approximately 50mph. He could see details from a metallic surface that was well polished and reflecting the sunlight. It’s size calculated at around 35 feet in length and 12 feet wide, showing a slightly oval, cigar-shaped object. There were at least four round windows on each side of it and the front end had a hole three to four feet long, decreasing into a crack that took up half the length of the object’s right side, from which could be seen a white smoke coming out – similar to that of dry ice. According to the witness, it seemed to be damaged. Eurico de Freitas and his wife Oralina Augusta. At 01:14am exactly, Eurico woke up, startled by a commotion and noise outside. He glanced at the alarm clock and got up, fast telling Oralina, that the cattle were restless and that people were probably stealing the calves (this happens a lot in Brazil). He went over to the window to have a look and could see that the cattle were moving and lowing desperately. As the house is situated close to the pasture, which extends up the hill, Eurico went to the sitting room window to check up the hillside, the eeriest sight met his eyes. He said that a submarine was flying over the pasture, about the size of a small bus with round ends and a lump on the top. The investigators tried to compare the description given by Oralina, who had been so worried that night, that she went to join her husband by the window and also saw the object. She said that it looked like a large cigar and that the thing that could have possibly been a dome could not be seen very clearly. It was flying some 10 feet over the pasture and was very, very slow at times, almost as if it had stopped. No noise came from it or any lights and it was dark grey and was only just visible because of the night being so clear. It was leaving a white smoke all around the surface and at the back end, they could see something coming out of the smoke. Oralina tried to explain it as tattered bits of cloth trailing threads blowing in the wind. Eurico said that if you set fire to a stick and run along with it to see it sparkling, that was his impression of the detail, adding that the fire had no colour and had smoke in it. the object took more than 30 minutes to disappear behind the hill. 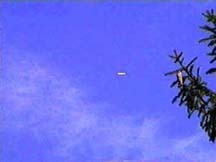 The daytime footage shot by Mr Jerome B. Turner (Equinox@ids.net), clearly shows an anomalous cigar shaped, structured craft moving from left to right and disappearing behind a nearby tree.The cameraman claims "The craft was approximately 1000 feet above the ground and was heading West to East at about the same speed as a slow moving plane. The leading edge was black and what looked like a black stripe or row of black squares was on the side." Huge cigar-shaped craft. This craft resembled the fuselage of a regular passenger aircraft but it was much bigger and longer than your average airplane. 2001. Building 8 at Johnson Space Center, Houston, Texas. Gary McKinnon. It was a silvery, cigar-shaped object with geodesic spheres on either side. There were no visible seams or riveting. There was no reference to the size of the object and the picture was taken presumably by a satellite looking down on it. The object didn't look manmade or anything like what we have created. Similar to the image supplied by Dennis Plunket of the British Flying Saucer bureau. Fernando Avalos wasn’t expecting to see a UFO on the 12th of October. According to Peru.com, the unusual sight of a cylindrical object moving at speed across blue skies was recorded at 17:45 hours and was witnessed by sixty students between the ages of eleven to twelve and four of their instructors in the city of Chimbote. While the sighting went on for about three minutes, the recorded segment only displays seventeen seconds – the amount of time remaining on the videographer’s memory card. Naysayers have dismissed it as an airplane; believers say that it goes to show that Peru’s decades-old reputation as a UFO haven remains unchallenged.